Find My Workspace lists over 95% of the business centres market in Crawley. Simply click Request Quote to check pricing for one office, or Add to Basket for multiple offices. 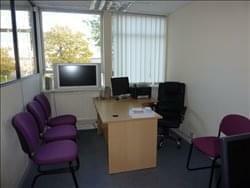 Flexible office space with free parking and on-site storage available. Price fully inclusive of rates and electricity. Offices available range from 200 – 1,000 sq. ft. Facilities include on-site meeting room and kitchen. Good decoration throughout. Friendly onsite team. Onsite storage solutions also available. In the heart of Manor Royal just two miles from Gatwick Airport.